Maps do not duplicate reality but, rather, represent a manageable, scaled version of it. This is apparent in both digital and print cartography. Within the digital realm, web-enabled multiscaled maps are in increasing demand and require the seamless depiction of data over a wide variety of scales. Correspondingly, in print cartography, it is cost- and time-effective to produce multiscaled products from a single database that has been compiled only once and can contain and manage all updates in one centralized place. Being able to display data effectively at a variety of scales is imperative, but to do so, most data must be generalized first to retain clarity and characteristic form when displaying it at smaller scales. The features of a spatial database are captured in various ways: from imagery, aerial photography, existing maps, terrain models, and even waypoints. The geometry and position of these features are at a resolution and precision that is intrinsic to the scale of their sources. When the data is displayed in a map at exactly this scale, appropriate feature density and precision are maintained. Displaying data at a smaller scale than capture scale is acceptable, but display at a larger scale is not, because it implies a greater degree of precision and inclusion than what is actually present in the data. Therefore, it is advantageous as well as cost- and time-effective to collect and maintain data at the largest scale possible, and then modify it with generalization to display it at a variety of smaller scales. Generalization is an inherent and challenging part of cartography. It is the process of deciding which features to keep, which to eliminate, which to exaggerate, and which to simplify to communicate clearly the nature of a landscape. The challenge lies in how to depict the geography as faithfully as possible while reducing extraneous detail and preserving the characteristic arrangement of the data. Contradictory requirements must be resolved while maintaining the most graphically rich and informative display possible. On a larger-scale map (1:18,000 scale), small buildings, local streets, and individual freeway lanes can be shown. 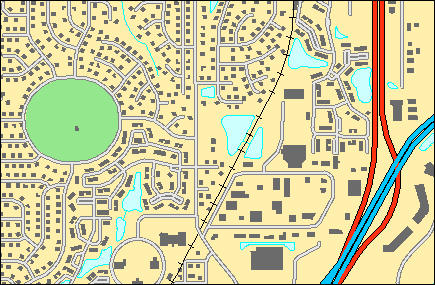 On a smaller-scale map (1:36,000 scale), features must be generalized to retain overall clarity. Generalization must consider not only individual features, but also the spatial and contextual relationships among the features whose patterns are visually characteristic of the landscape. Everything placed on a map must compete for page space and legibility. Some features that are not physically visible in the landscape—like contour lines or administrative boundaries—must be drawn and labeled on a map alongside all the apparent features like roads and waterways. Some features must be drawn with symbols that are larger than their corresponding ground size to be legible. These realities contribute to the coalescence of graphics that is exacerbated by reductions in scale, triggering a need for subsequent generalization to take place. Transformations may be straightforward and applied to a single feature, like the simplification of a river by removing extraneous, detailed crenulation. However, it is easy to see how a seemingly uncomplicated modification like this can trigger a requirement for additional contextual changes. Removing small bends from a river may result in the river flowing through buildings or being misaligned with bridges and contour lines. Most generalization tasks require that features be considered contextually to ensure clarity and allow collective patterns to be recognized and retained to preserve the characteristic appearance of the local geography. 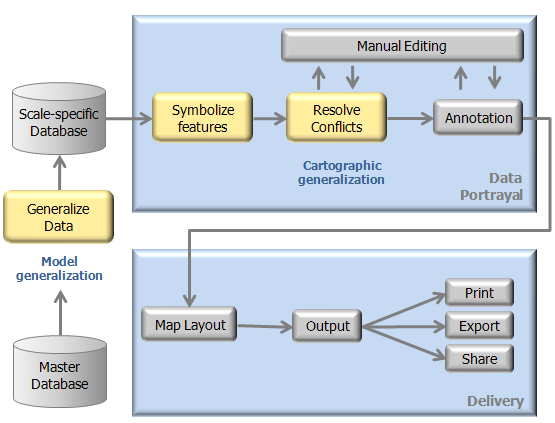 Generalization is usually performed as two distinct phases in most cartographic production workflows. When more than one scale range is to be derived from a master database, it is common to process the data first to make scale-specific databases from the master. The scale-specific database is usually intended to cover a manageable range of scales within which features would generally be displayed the same way. The steps followed to process data for a scale-specific database are not technically cartographic operations. The symbolized display of the data is not established nor considered, and themes are not compared for conflicts. Instead, feature density is reduced and feature detail is simplified as appropriate to the scale range. This is typically called model generalization. The second phase, cartographic generalization, typically takes place during map authoring after a map's purpose, specifications, output mechanism, and scale have been established. Symbolized features are considered contextually across data themes and against other map elements such as annotation, neatline boundaries, and grid and graticule lines. At this stage, the complexity of individual features and overall feature density is assessed and modified to preserve clarity across the map. Symbol conflicts between features are also assessed and resolved at this stage. The symbolized footprint of features at scale is often much larger than their corresponding footprint on the ground. The smaller the map scale, the more this tends to be true. Conflicts may be simple overlaps of features or may be more complex issues like the misalignment of portions of multiple freeway lanes.